One of the most frequent questions on the AO loop is the one of placement--which is often one of the hardest questions to answer! I believe YOU know the needs of your child better than I do, so all I can do is to offer some guidelines on placement issues. "AO Newbies" come in a few different varieties, from those who have never homeschooled to those who are well versed in CM's philosophy. Those coming from the Public School OR textbook HS arena seem to have a very difficult time selecting WHERE to place their child in the AO Years. One reason for this is that AO's literature-based curriculum is vastly different than the type of curriculum the child has been doing! I think we are all apt to assume that the AO Year is equivalent to the PS grade because of the way the schedule is arranged on the web page. I DON'T believe this is true for those transitioning from the "textbook world". Textbooks are "different animals" from the living-book literature we use on the AO schedule. Textbooks are like the commercials on your TV-they are only a quick "blurb" and then you go on to "the real show" i.e. real life... and like commercials can be easily forgotten. When minds trained by texts are confronted with the "meat" of living books, they must learn HOW to think in a much deeper way than they have done previously. Let's think of switching to AO in terms of starting a new weight-training program. As when starting any new exercise program such as weight lifting, one may need to start with the easy weights before the 150-pound weights are even attempted. Before we can even start the program, we must evaluate our fitness level. If we have had no weight training regimen, then we'll start with "light" poundage, gradually building our muscles until we reach our weight-lifting goal. Each "lifter" must determine the amount of weight they can safely handle to start with in order to design their own, customized exercise program. Too much weight and the person might be "hurt", have to taper off, or even quit in order to re-adjust their goals. They may even quit altogether in frustration! Too little weight, and the person is easily "bored" because their goals are too easily met. So, picking the correct starting weight is of paramount importance to designing a weight regimen that is both realistic and healthy. If we are to transfer this weight-lifting analogy to our selection of AO material, it follows that we must carefully consider the "weight" of the material our student can handle. A survey of current skills should be made, if they aren't already known, evaluating against the prospective AO year's material. The easiest way to do this is to use books you already have on your shelves or print a few pages of an online e-text (which you can link to from the AO site) so that you can have the child read and narrate (tell back what they just read) from the books themselves. This will give you the most accurate picture of the material the child is able to successfully master. If you are unsure of what level to use, try books from 2 (or more!) different levels in your evaluation session. Be sure to try several selections, since a year 3 book may have the PS reading level of 6th grade. AO is considered by most to a very advanced, and I personally recommend a at least one AO year below their current "grade". If a child is struggling, especially with reading, 2-3 years below their current level may be appropriate! 1. Can they read ALL of the material? Or a majority of the material? Although the child's comprehension level probably is greater than their reading level, I'd advise you NOT to fall into the trap of reading all their books just because the student can comprehend the harder material. What will probably happen if YOU, the parent, continue (long-term) to read ALL the student's books, the child will never develop their "reading muscles" and you will have to continue reading their books! This might be "do-able" (but difficult!) for one or even two children; but if you were putting multiple children into the AO curriculum, I'd strongly advise you to place them in AO years in which they can read the majority of their material on their own. Try to start them on a level that will be challenging . . . but not frustrating! Not sure? In my opinion, it's better to start the child on an easier level and move them up, rather than starting them with material that's too challenging. It sounds more positive to tell the child, "We're moving you up a level because these books are too easy for you", which will give the student added self-confidence during their transition to a literature-based curriculum. Imagine the stark contrast created by, instead of promoting self-confidence, to "demoting" a child who is struggling, and giving the child the impression they're "behind" --especially if the AO year APPEARS TO THE CHILD to be the same as their grade level! 2. How much would YOU as the parent read to the child? As a GENERAL guideline by year 3 the child should be reading the majority of books on their own. However, when first starting, you might consider making the transition to reading easier by reading a few of the harder books, and then gradually hand over more and more books for the child to read. Remember, your child is having a MAJOR transition from the textbook world to the "land of literature"! They are probably NOT used to sitting and reading for the amount of time that it would take to read ALL their own books . . . unless you have a child who dearly LOVES to read! I began by reading nearly all the AO year 3 books to my children when I first switched them over to the AO curriculum (I was also starting with a LD child). Each term I gave more and more responsibility to the children for reading their own books. It didn't take long for them (including my LDer) to "build their muscles" and read nearly all their own materials except the ones I chose to read aloud! 3. Placement may also need to be determined by how many children you will be teaching. If you are starting out feeling very overwhelmed and teaching several children (with some of them close in age), you might consider putting two in the same AO year for the basic subjects like history, science, as well as the fine arts areas. This will give you the advantage of starting out with less AO years to teach. Some moms don't like to place their children in the same year, because of sibling rivalry, but I just tell mine we're doing "unit study approach" on the subjects in which the order doesn't matter. Then they are put in different levels of Math, Grammar etc. 4. Material selected should start with the basics, and add in the "extras". I believe parents often are tempted to fall into the trap of "trying to do it all"! We find this outstanding selection of curriculum that we "fall in love with" and we can't bear to leave anything out!! But there are some dangers in starting out with the full load . . . and not JUST for your child... Yes, your child might be overwhelmed by the sheer volume of material they may suddenly find thrust upon them . . . If that's likely to be the case, then introduce lessons slowly -perhaps taking two weeks to finish 1 AO week until the child becomes accustomed to the level of work required. But also consider what happens to Mom . . .
She falls in love with this "new way" of doing school, and is "gung ho" delving into ALL aspects/subjects of it with a relish the children might not share. Perhaps one or more of the children "rebel" at this new, imposed "labor" and Mom must deal with the character issues of this child. But she's got a few other children who also love the new style of school; so, she perseveres . . . She decides that she must "do it all" if she's going to do it "right". After all, what could be easier? It's all laid out for her, right? Mom may stay up late at night reading CM's original series, or spending HOURS pouring over the AO web site and it's links. Before long though, Mom is battle weary from the constant skirmishes with the "rebel child"! But she also has other children doing school that she must stay one step ahead of, in order to "figure out HOW to do it"! Mom quickly becomes exhausted with the frantic pace she has established for herself . . . She starts dropping books from the reading list and feeling guilty, or overwhelmed, or ready to drop out of the AO curriculum altogether because she has discovered that she has tried to do more than she was ready to do! Remember our weight-lifting example? Well, MOM must make sure SHE can lift the weight of this new school too!! If you're having a baby this year, or moving etc.-- start with the basics, and as you are ready; keeping gradually adding, subject by subject, to this rich curriculum until your plain cloth becomes the beautiful tapestry that you've dreamed of creating for your children's homeschool career! 5. I highly recommend any "newbie" to join the AO loop and ask your questions. These ladies LOVE answering your questions! Although there are a lot of e-mails each day, it's WELL worth it! (Just have hubby make a file in your inbox and set a message rule for it. That way you file all your AO e-mails and can read them at your leisure without them clogging up your inbox!) I've learned much more, on the day-to-day workings of a CM homeschool, from the ladies on this e-loop (and, of course, the AO website!) than I have by reading (and I'm reading and leading CM support groups!) any of the books about Charlotte Mason! Sign up . . . you WON'T be sorry! As you begin your new literature-based homeschool it's nice to know that you are NOT alone, and there are friends waiting and ready to help you through this process!!! 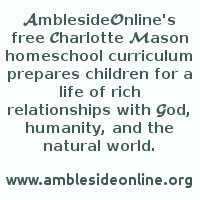 Please ask our advice, as we'd love you help you have the most successful CM/AO homeschool experience possible! May you be blessed in your new AO homeschool!! Moderator AOwithLDKids, a support group for those using AmblesideOnline's curriculum with their children who have a learning difference i.e. a "learning disability".